If you are reading this article, it is most likely that your life are heavily depends on the Internet. The Internet assist us on our daily life and also provide us entertainment, from searching for direction on Waze to watching funny videos on YouTube. Yet, not every Malaysian households have the access to the Internet. In 2016, only 62.02% of the average household in Malaysia, which is less than two-third, have subscribed to Internet service. Tongod (Sabah) has the lowest number of average households subscribed to Internet service, at only 19.4%. Big cities like Putrajaya and Kuala Lumpur have the highest amount with 96.5% and 96.1% of the average household have subscribed to the Internet. 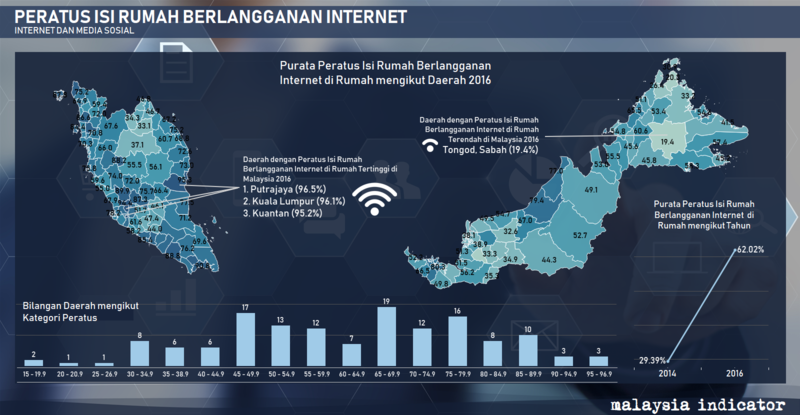 Overall, the districts with the lowest average household subscribed to Internet service are primarily located in the rural areas of Kelantan, Sabah and Sarawak. In this age, the lack of accessibility to the Internet does not only show the sign for the lack of development, but also will affect the district development process as Internet can be a tool for conducting business and acquire knowledge which can help in expanding the economy.